I m taking apart my forks to change seals and bushings and when I looked a the springs and spacers they do not at all match what the spec says they should be. The spec in teh Kawasaki manual says they should be 457.5 mm long and these are more like 550 mm! Plus the spacers are much larger in the diagram than the two thin washers in my shock. I know it's nearly impossible to tell what these are, but my question is....these are NOT stock....right?? Re: Stock 96 KDX Springs....OR NOT!!! Don't appear to be. The info is on here somewhere on alternate spring sources. I think it was XR400 springs that were longer but worked with a spacer change for heavier riders, IIRC they were in the 540mm range. Really no way to tell unless you can get ahold of the PO who did the swap. Those are probably Progressive brand fork springs if they are aftermarket. They are wound progressively, not linearly. 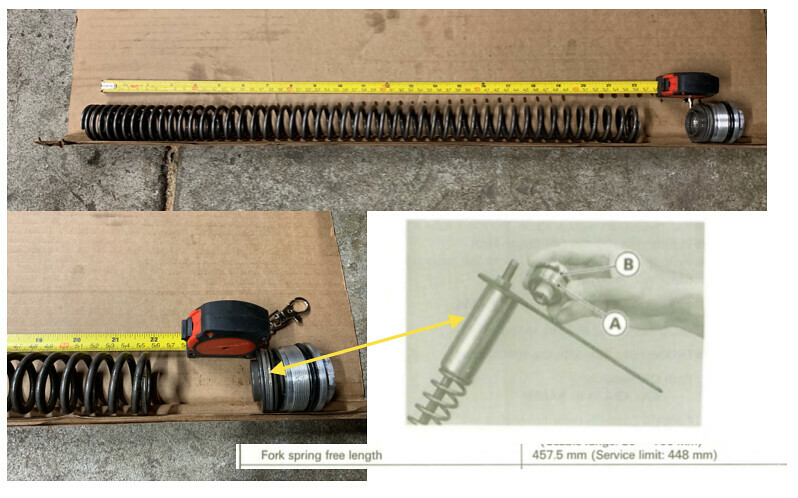 I don't know of any other brand fork springs that are progressive instead of linear. Thanks, I pretty much already knew that I was just looking to confirm. Hoping for the off chance someone might know what they are! Thanks again guys! Any interest to change the cartridge rod bushing while you have them apart? I can give you pointers. Sure!! What I am concerned about is I don’t know the spring rate. If they where stock I would have at least had a starting point. You can measure the spring rate with a broomstick, a yardstick and some workout weights. Do you have those? Do you have a heat gun or low heat torch? After the cartridge is out, the deal is to separate the head of the cartridge from the cartridge. You will need a tool to hold the inside of the head. It is 27mm nut. Warm up the cartridge head a little with the heat gun / torch and then use a smooth faced hammer to lightly tap around the OD of the head. That will break up the Loctite on the inside. Use the 27 mm tool to remove the head from the cartridge. The bushing is inside there.